Figuring out how much you want to put in your food storage can be overwhelming. Most suggestions on the internet focus on long-term foods. However, if you are following the current home storage program taught by The Church of Jesus Christ of Latter-day Saints, you will want to start with a 3-month supply of every day foods. Don't Panic. Food prices have always gone up. Disasters happen every day. Don't panic and run to the store buying cases and cases of food you don't know how to manage. Don't run faster than you are able to afford. Pick a budget like $20 to $30 dollars a month per person, and have some self-control. Over the years I've been patiently gathering which has taken a ton of faith. But it is worth it. "I don't eat canned food." Some people truly can't eat canned foods. I can't help you too much. But I bet you have some recipes your family would use if your husband ever lost his job or an earthquake hit your town. I prefer my homemade spaghetti sauce over Ragu any day. So I stock up on canned tomatoes for that recipe. Someday we may not be able to afford fresh spinach from Costco. And most families only have a 1 week supply of fresh foods in their home. So be realistic and create a plan with items that can be stored. I always suggest starting with a 3-month supply of food your family eats right now. Most people panic when they hear a year's supply of food. Even a 3-month supply won't be easy for some of you to gather, but it's a place to start. It's STEP 1 of the LDS Home Storage Plan. Some people like to create menus first, and figure out the gazillion ingredients for those menus. I've done that, but it's not very easy. Others suggest you create simple meals like spaghetti sauce + spaghetti = a meal. Personally, I think you you know how you cook and can plan a few menus. Short-term foods - these foods on average have a 3 month to 10 year shelf life. For example, boxed breakfast cereal has about a 1 year shelf life. But a can of corn has a 2 -5 year shelf life. Long-term foods - these foods have a 20 - 30 year shelf life because they sometimes have been carefully sealed with an oxygen absorber packet. But not always. These foods are usually dry and without oils. Most of the foods in your 3-month supply will be short-term foods. So where do you begin? Here is a suggestion of how to create your own rough draft 3-month food storage plan. 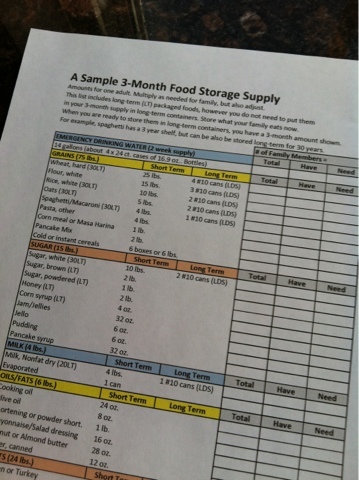 Print out a Sample 3-month Supply of Food Storage Supply.pdf for 1 adult. Remember, I have no idea how much your family eats. But the list of items will get you thinking. Go through the list, and put a check by items you eat now or might consider using. Cross off those items your family does not like or can't eat because of allergies or medical conditions. But be open minded to other foods. Some long-term foods are listed like wheat or dry milk. If you don't want to gather a small supply of them right now, you can save them on the list and gather them after you complete Step 1, Step 2 and Step 3 of your home storage plan. Long-term foods are Step 4 in the plan. Look over the suggested amounts and multiply them by the number of family members. You can divide numbers in half for children, but you don't have to. Don't get too detailed. I promise later on you will add or delete items and change amounts. Storing yams did not work for our family. Canned carrots is not working either. So just put together a rough draft. Go on a hunt through your home and find shelf-stable foods you already have on your shelves: foods that have been sealed so they can be safely stored on a shelf for awhile. These foods are canned, boxed or packaged. Take your kids with you and make it fun. As you search, write down on another piece of paper other items you have on your shelves that are not on the list. Use my categories to keep it organized. List the number of items you have and the detail. For instance: corn, 15 oz. can, 2 ea. Type up your list and there you have it. Your own rough draft 3-month food storage supply plan. I promise that as you spend time working on this, you will feel a whole lot better. It's all part of the journey, but it's well worth it. 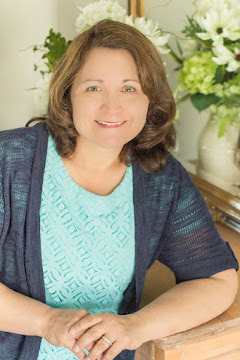 I would love to hear about your experiences creating your own 3-month food storage plan. I appreciate all your good posts. They are very helpful! I love your website and have been subscribing for quite some time, I just noticed something about the website today. I don't know how long it has been doing this but if I use Google Chrome as my web browser it shakes and is quite annoying to say the least. It starts on the right hand side right below where it shows the "members" all the way down and wrapping around to the bottom of the page. However, if I use internet explorer it does not do this. I don't know if there is anything that can be done. Just thought you would like to know. Hi Joe, I am not sure what is happening on your computer. I've never had that shaking problem. Is your Google Chrome the most current version? Maybe you should run a virus check. So sorry that is happening on your computer. Hi Valerie, I'm really enjoying your site and all the useful information. In working on my 3 month supply list, I have printed out your 3 month supply pdf, but am wondering if you have it in a editable form somewhere as well? This would save me so much time! Thanks! These are pretty general but the basics for the majority of our regular meals. I then made a list of the 8 meals for each we enjoy the most, added in different side dishes, condiments, and other extra ingredients. Wrote the average amount of each ingredient I use for those meals. Then I added the amounts for each ingredient and took it times 11 giving us roughly a 3 month supply list. I buy powdered milk to replace fresh, either can my own or by canned for most of the ingredients and purchase bulk packages of the dry ingredients. Then I branched out and started adding in the others like meat, cold cereal, fruit, spices, etc. The bit about "you don't eat canned food" caught my eye because my family generally prefers fresh over canned, too. Especially meat. What I do is buy a week supply of canned tuna, chicken, jerky, beef stew, etc. (or whatever it is you don't like to eat out of a can). but then I make a prominent note of the expiration date. About a month before expiration*, if my family hasn't consumed the item, I'll either donate it to a food pantry or pass it on to a friend/relative that I know enjoys the item. This way I'm prepared if I lose my access to fresh alternatives, but it also doesn't go to waste if my family doesn't use it. *I use the one month mark because Wisconsin food pantries don't accept food that is expired. I eat expired food with reckless abandon and I'm just fine. I just found this and the list provided is by far the best I've encountered. I'm a single senior and most lists are done for a minimum of four people but this is prepared for one and I love it. I used it to create my own list by adding some items and deleting a few that I don't use. Thanks so much for such a comprehensive list.